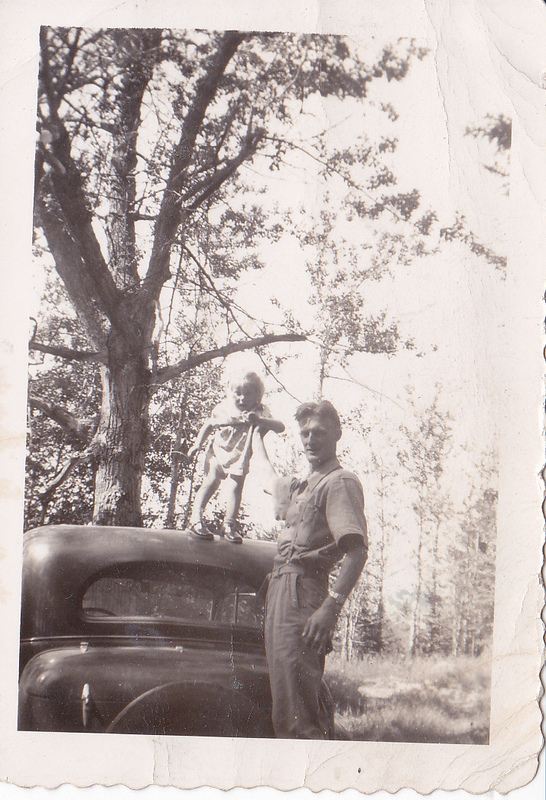 Ayah..that is my dad, Beryl A. Martin scaring the wits out of his only daughter by holding her up on the roof of what I think was his 1936 Ford. Times have changed, people have changed, my home town has changed. I knew my dad for 28 years and his sense of humor, impulsivness and his reputation as a real character did not change. I am about 74 years older than that whimpering child in the photo and during those years, I’ve seen many changes in my home town of Lockes Mills, Maine. Some things remain the same; there’s the church and the town hall still standing proudly, albeit the church has been improved over the years and the town hall waits for its improvements to come. I remember climbing the long, cement steps of Arthur Vallee’s store after getting off the afternoon school bus. If I had a coin in my pocket, it would be a short time before I was back out on the steps, with my dixie cup and wooden spoon. I couldn’t wait to see what movie star would be featured on the inside of that cover! The metal railing was cool to the touch as was the ice cream as I divided the vanilla from the chocolate side. Soon the mill whistle would blow and I’d dash to the parking lot to ride home with Ma and Dad. Things had changed since I started high school and no longer could I have the house warm and supper ready for them when they got home from work. If Vallee’s store was my refuge in the afternoon, then Hank Leach’s store at the top of the hill welcomed us each morning before the bus arrived to carry us to Bryant Pond. In the winter time, Hank would come early, unlock the door and usher us in where it was warm. We sat on a plank over the radiators to warm up after our first cold blast of the winter morning! The bus did not take us on a direct route to Bryant Pond! How simple that would have been instead of taking us over the Gore Road, picking up students, and then taking a right down through Pinhook and still going until we picked up Route 26 again to go down Merryfield Hill to the school. What could have taken ten minutes seemed to take forever! The Coffin kids and Cushman kids were our last pick ups and then it was non-stop. Lloyd Cushman was our bus driver the first year and thereafter, Art Farrington did the honors. How well I remember Terrill’s store when I was very young. The teachers marched us, two by two, on the last day of school to get an ice cream. As I grew older, it became Jordan’s Restaurant and what a wonderful place for the teenagers to go. There was a jukebox and the jitterbug was popular! Ray Langway owned the little store on the corner and that was a popular meeting place on Sunday morning for the paper to read and for dad to take his little blue can for the weekly refill of kerosene. That changed hands down through the years as I grew. The old mill burned in 1950 and was replaced by the more modern Ekco plant later, but who can forget the little wooden toys and the toy parts! Dad always said he worked at the Popeye plant! I can’t forget Mrs. Lister and the post office. Going by her establishment and jumping the little brook to go to school was absolutely forbidden and if she chanced to see an offender, the teacher was notified immediately. The street was lined with big houses, some of them beautiful to look upon and how I wished I could live in one for just one week ..or even a day! I could not imagine all that room!! Mrs. Marshall at the top of the hill had a big white house I always admired. I haven’t been back to Maine for a couple years. Somehow, I always feel sad when coming down Route 26 to see the houses gone and I want it just the way it used to be. Then I read about the local strawberry festivals, the dances at the Legion Hall, benefits for those in need and I realize, the town has changed; the people haven’t. They are the same good people who have always lived in that beautiful little town. A person cannot grow up in a much better place than a small village tucked between lakes and mountains. I have been fortunate indeed. The picture shows my Dad just the way he was. No nonsense and I am amazed to see he actually had his arm around my shoulder. 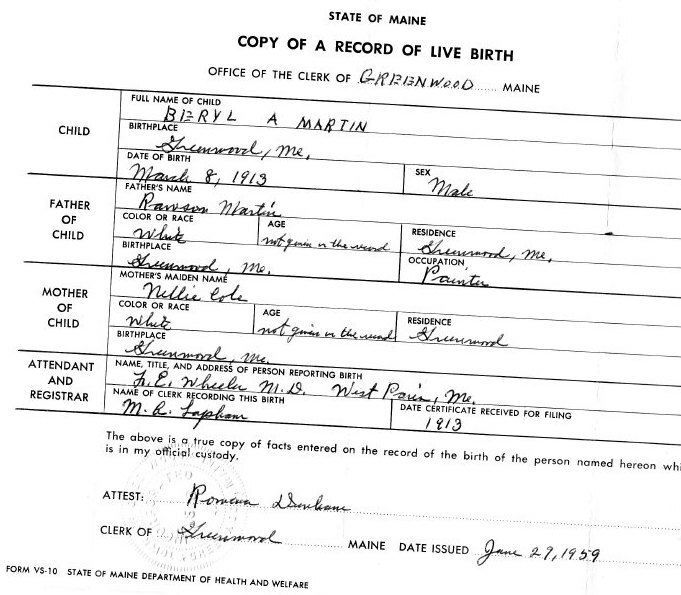 Back in “those days” most men in that Maine woods area either did not have the time or just did not take the time to show much affection for their kids. Nope, even in my wildest dreams could I imagine his doing what Dads do today….take me to a park, push me in a swing, play catch. Nope. Not my Dad. Oh, he did hang a rope and tire from the old apple tree in the corner of our yard. We did a lot of swinging, but Dad never pushed! He took me fishing, though. I was allowed to ride in the boat when he trolled for a white perch on Indian Pond and how well I remember the times he rowed us around Twitchell Pond in his pursuit for the elusive brown trout. He taught me how to gut and clean a fish. Well, he told me if I liked to fish that well, I had to clean everything I caught…..and that resulted in the lesson. My father had no patience. That is not criticism; that’s a fact. When he wanted something done, we should be prepared to do it. My two older brothers were the brunt of the Martin wrath when things were not as they should be. He hated holidays and cussed at the Christmas tree because the branches kept hitting him when he maneuvered past it in our little house. If there was a grinch in Greenwood Center, it was my father. —and yet, one day we were in Ray Langway’s filling station in Locke’s Mills and I saw a jacket..oh, it was beautiful maroon and gray, our high school colors. I told him how much I loved it and he replied that it was a man’s jacket. I said I didn’t care. The matter was dropped. When he came home the next payday, he had the jacket on his arm and said, “this is what you wanted, right?” I was bowled over as we were taught not to ask for anything. There was a streak of kindness in the “old man” after all! I will remember my father for his sense of humor which was known throughout the area. I will remember his teaching us the night calls of birds and animals as we lay on our mattresses in the little camp at the foot of Indian Pond. It is because of him I know I will never try bear meat again; that one can eat raccoon and survive and that yellow perch are wormy in August. Not your Brady Bunch Dad that is for sure. But sometimes, in retrospect, I wonder if he actually knew he had four kids. His world was the outdoors and his mind was in his books. In later years, he softened. When my first baby arrived, he sat next to me, took Debra’s hands and said, “Hmm, long fingers. She’ll either be a piano player or a thief.” That was how his mind worked..and he followed it up with, “You should have named her Francella.” “Why, Dad?” “Because I saw the name on a gravestone in a cemetery and it suits her.” Never mind that months before he had suggested I name the baby Debra. That was my Dad. The man who went into a rage and did not want to be called Beryl after he received an ad in the mail to take a beautician course. He wanted to be known as “Bob” or just B. Martin. The man who eradicated bats by shooting them in the attic, giving us several small sun roofs. Life was never boring with my father. 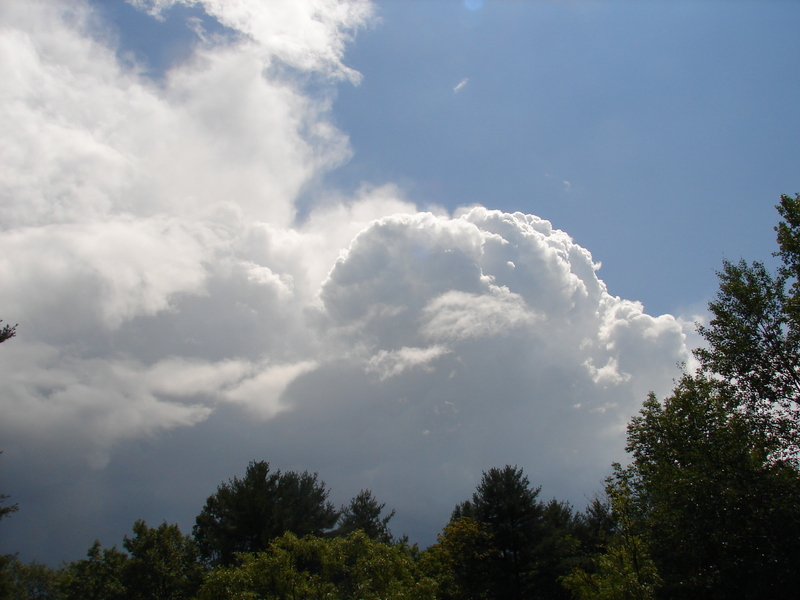 I wrote an article for a Maine magazine years ago and called it, “Living with a Whirl wind.” That about sums it up. Ma insisted she was taking me to the doctor. I insisted she was not. I was 12 years old and had never seen the inside of a doctor’s office and I did not think this was the time for a visit..now or ever. Pains in my side all day and one night was more than Ma could stand and so to Bethel we drove. Right up Paradise and into the parking lot. I knew Dr. Boynton, because he came to school and administered the small pox vaccination, which looked plain ugly on my arm forever, it seemed. I was in no mood when the good doctor told me to climb on his table and I refused. Ma, embarrassed through and through, told me to get on the table. I insisted that Dr. Boynton tell me what he was going to do before I subjected my body to his hands. Visions of scalpels and operations raced through my mind..obviously from some of my books I read constantly. After much haggling, I climbed on the table, closed my eyes, figuring this was probably one step from the grave. The good doctor pressed and pushed on my side and since he heard no screams, told Ma to take me home and for me to rest another day before going back to school. That was the first and only good word I heard all day. Ma chastised me all the way home for acting the way I did and she swore she heard the doctor sigh when we left. I hastened to remind her of my episode with Dr. Brown, the dentist in town, a few years before. Did she remember shaking me and rattling my brains to get me to “wake up” after my tooth was pulled? Ha! I guessed not. Well, after that reminder, the ride home was long and very silent. Back then, you just did not go to the doctor to “prevent” something. Nope, you went to see the doctor when you were sick. Period. Dr. Boynton came every other Saturday to see my Grandfather Martin because of his arthritis. I’d see his car pull in and Dad would usually remark that the Doc was in Shadagee again. Remember Dr. Nangle in his brown house on Pioneer Street in West Paris? Ah, yes. How many times did I sit in the waiting room, baby in arms, waiting my turn. We always dreaded the person who went in to see the doctor and more or less also wanted to visit while we waited and waited! I can’t remember making an appointment for any special time, but always called to make sure he would see us. So we gathered, like cattle, in the little waiting room. Sometimes there was nothing but silence and even that seemed to echo as some sat in misery. Other times, old friends met and the latest news was exchanged. I remember one night holding Debbie for almost an hour waiting my turn, and an elderly lady asked if she might hold the baby “for a minute.” What a relief just to rest my arms for a moment and she truly enjoyed holding her. Dr. Nangle was like a rock, it seemed to me and probably many other young mothers. Brian fainted in the June sun and hit his head on cement, so what to do but call my neighbor, Winnie Hanscom, who called Dr. Nangle and stood in her driveway as I deposited Debbie and Gary in her arms. We arrived and Dr. Nangle shooed his patient out his office, grabbed Brian, took one look and called Norway Hospital to tell them we were on the way. Long story short. Brian was in the hospital 3 days with a concussion and finally a very determined mother, getting no information, stomped to the hospital, signed him out all the while having his doctor screaming. I cannot believe the determination that a mother has when confronting any situation dealing with her child. They must have thought I was horrid!! And while we speak of doctors, I cannot forget Dr. Young in Bethel. So many years ago but the memory remains so strong. A friend gave me steamed clams and oh, they were good. For.that.day. I woke up horribly ill and finally a call went in to Doc Young. He drove into my yard every morning for two straight weeks, empty coffee cup and a jar of instant coffee in hand . While he examined me each day, Debbie made him his cup of coffee. In this day and age, I would say that I had a bout of e-coli and would have been hospital bound. His orders were to drink two cups of scalded milk a day and Brian did that and brought it to me. Suffice it to say, if I could have lived in the bathroom, I should have done so. I did not get a bill for any of those house calls. Years later I lay on his table while he cauterized from my heel up the calf of my leg to my knee. I had fallen off the harrow and it had bent my right foot back under me and the harrow disc had cut up my leg. Doc was leaving for his home on the coast and stopped in mid-packing to do that deed and to administer my first tetnus shot. Can I say…ow??? 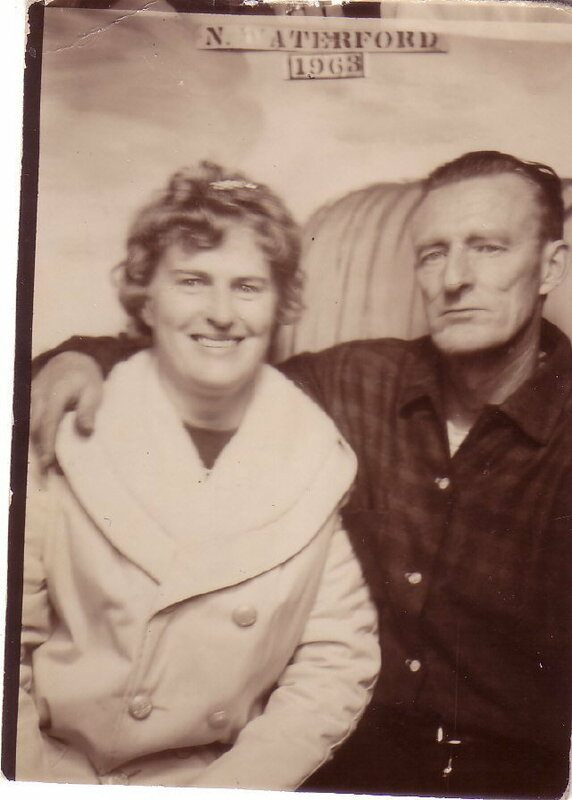 Doc said, “You know, Sis, some day you are going to have some awful arthritis in that foot.” You know what, Doc, I wish you were still around so I could tell you that you were absolutely right! There are so many other memories of our country doctors in and around that little part of Maine. They cared for their patients. They knew their patients and they knew the families. I believe that is one reason why someone in my age group ( old and getting older) is taken aback at health care as it is today. Sometimes I feel like a number. Sometimes I feel like there is x-ray vision into my purse. I know medicine has progressed over the years and I won’t argue that so many lives are saved in this day and age. So what is the ingredient that is missing? I believe it is a world of big pharmaceutical companies, insurance companies, the government and probably a dozen other factors producing so many laws, rules, paper work that yesterday’s doctors do not , cannot exist anymore …even if they want. I have found one doctor and though he doesn’t make house calls, for the past twenty years, he has pulled up a stool and has taken time to talk. That means a lot in this day and age. I think there’s one in every town. Perhaps it is the little post office where people gather to exchange news, the barber shop where you get clipped and inhale the latest news, but in my home village of Locke Mills, Maine ( and back then we called it Locke’s Mills so who knows?) it was the Town Hall. Oh , that precious building whose walls can never talk, but oh, if they could! It was the hub of activity for all ages and I first encountered the hallowed hall when I was probably eight or nine years old. Grace and Charlie Day asked me to attend the Ken MacKenzie Show with them. The very distinct smell as one entered the hall was one of oiled floors or maybe just the aroma of excitement. Hard, wooden folding chairs were set up in rows. Soon the big wine colored velvet curtain parted and there was the man himself. My heart went into my throat and I could scarcely breathe. After a few songs, he waved his arm to his left and said, “Say hello to Simone, the Missus”…well, the audience just went wild. Ken MacKenzie was not the only traveling, singing cowboy. Grace and Charlie treated me to another show. As the curtain was pulled, there stood a big man with a guitar singing, “Come along and listen and I’ll sing and play for you, I am the Lone Pine Mountaineer”…oh, how I loved to hear him sing and his wife, Betty Cody yodel! One evening they brought a special guest, a young singer named Hawshaw Hawkins and I went home with an 8 by 10 autographed picture! Years later, he was killed in the same plane crash that took Patsy Cline.In my career as a writer/ reporter, I wrote a two page feature on Betty Cody. Strange how life turns sometimes. Grammar school kids marched down the school sidewalk, assisted across the Bird Hill Road by teachers to the main road and marched two by two down the sidewalk . Teachers held up what little traffic there might be for the kids to cross Route 26 and we were in the Town Hall…the magic place. Whatever the occasion, we were always thrilled to think we were going there…even if it were only to decorate or set up chairs. The local grammar school put on plays and many times I stood on the stage singing duets with my friend, Kay Dorey. There was the 8th grade graduation and down the aisle between the wooden folding chairs I marched, dressed in white and trying to keep my balance wearing white sandals with heels a bit higher than Ked sneakers. The Greenwood town meetings!! Once we reached the 8th grade, we were permitted to attend for a short time. Residents sat, Greenwood Town Report in hand, following the proceedings article by article. Occasionally a discussion turned into a cacophany of voices, but neighbors were neighbors and the meeting usually was adjourned with a few grumblings and mumblings. The old Town Hall stood straight and tall through it all. As a very nervous 18 year old, I stood in line to sign up for unemployment benefits downstairs in the hall. The line snaked around a table; when my turn came, I answered a few questions and bolted. In this same room, many a Saturday evening, I worked in the kitchen and waited tables for church suppers. The Ladies Circle provided a feast fit for a king! I took ballroom dance lessons in that hall..well, until I realized I was never going to be another Ginger Rogers. The years went by and the hall stood the test of time. It was the only place..THE place for my first wedding reception and years later, my four little ones paraded around the same floor in their Halloween costumes hoping for a prize. I attended my first Union meeting in the Town Hall and all the Union sponsored Christmas parties as well. There were benefit dances to help those in need or to ease the grief of someone taken much too early in life. Fast forward to the early 1980’s and my son Alan and I returned to that magical stage to sing in a benefit for the town’s recreation fund. As I stood there, looking out over the audience, all the memories came flooding back. You can’t beat that for great childhood memories. I hope somewhere, in some other small Maine village , there is still a magic gathering place that will hold memories for some little girl sixty years from today. My childhood was void of iPhones, iPads and neck-bending texting. We had no playgrounds per se. Our playground was the great outdoors and what we did with it was our decision. Hunting and fishing were as much a part of our lives as eating and sleeping. But there are little bits of fun that pop up in my head occasionally. The Old Man of the Mountains!!! What a sight to behold. My mother’s friend, Lucy, decided one Sunday that Ma should take the three youngest kids and accompany her on a trip “around the White Mountains”, as it was referred to in those days. We were some excited, I can tell you. This was before Ma had a driver’s license and our fun rides were limited to Sunday drives with Dad. Dad’s drives were always the same…up through Newry. Stop the car and point at Mt. Spec or Mt. Speck or however. I never saw it in writing, just heard him point it out with a grand gesture as though we had forgotten from the previous ride. Then we rode forever through trees and eventually ended on East B Hill. That’s all I remember…he was a fanatic about driving to East B Hill and home again. Now whether there was a pattern to this drive, I have no clue. But now we were going on a real ride..a different ride. We started out early in the morning and her old car chugged up Gorham Hill, past the drive-in as we three kids huddled in the back seat and shared the windows. After what seemed forever, there it loomed. We stood in the ditch and looked upward, mesmerized by the sight of the Old Man’s face on the side of the mountain. It was such a wondrous thing to see. We had heard about it, read about it, seen pictures of it, but there it was ..the real Old Man of the Mountains!!! After looking at it a long time, we continued on to another site called “The Flume”. I remember a lot of rushing water and this is where we had our picnic. We walked along the falls a short way, if I remember correctly. Back into the car and on we chugged. Now this is where it gets interesting. I cannot remember one other great site we saw that day, because the strongest memory is that we got lost. Lucy, Ma and three kids chugged our way into the darkness. Dad was at home waiting and Ma kept wondering if he was worried. These were the days of no cell phones. We were on our own. We kids dozed off in the back seat and I roused when Ma remarked excitedly that there was the Balsams so she knew where we were. We chugged and bucked into the door yard about ten o’clock that night. We had been gone thirteen hours and Dad was asleep and snoring loudly when we tip toed into the kitchen. Another adventure was my traveling to Benson’s Wild Animal Farm in Hudson, N.H. with a friend and her family from Shelbourne, N.H. Marilyn, her mother, and brothers Russ and Donny and I were to have a great day looking at the animals. We paused outside of this huge glass cage. I did not want to reveal that I was and still am terrified of snakes…but there one was looking as repulsive as it could possibly look. I thought I would stand a moment and move on and no one would be the wiser. As this thought passed through my head, Russ wiggled his fingers on the back of my neck. I screamed, people looked, the entire family jumped and I was horrified to make such a scene. The rest of the day remains in a haze. Bear Pond Park in North Turner!! What memories of those mill picnics! How we looked forward to those and prayed for sunshine. Oh, the ride though Sumner, West Sumer with the winding roads seemed to take forever to get there but so quickly we got home at the end of the day. Chicken or lobster dinner? We had our choice weeks in advance and I always chose chicken because I didn’t want to smell like lobster the rest of the day. One year Ma and Aunt Norma entertained us with jokes and songs. Charlie Melville put on a dress and pitched a soft ball game. It was such simple fun, but so enjoyed by everyone! When the music started in the roller rink, we sprinted to rent skates and try to avoid breaking a bone as we worked out way around the rink. There was always one or two gliding by to make me feel like an idiot. We had so little as did most kids, whose parents were mill workers, that we appreciated every bit of fun and every outing. I always hesitate to say “the good old days” as we have advanced so far in so many different directions that the world is better for it. However, there is a lot to be said for the simplicity we enjoyed and to those of us who had very little, a sense of appreciation for everything we had which continued on through our lifetime. We developed a work ethic by example from our parents and that has stayed with us. We developed a sense of respect for our elders and our educators. If we showed any disrespect to our grandparents, we received punishment at home. If our teachers said we were disrespectful, our parents took care of that at home…that very night!! Growing up in Greenwood Center was not all sweetness and light, but it sure prepared me for what was to come…and the fun memories remain to make me smile on an otherwise…maybe not such a good day…sometimes.